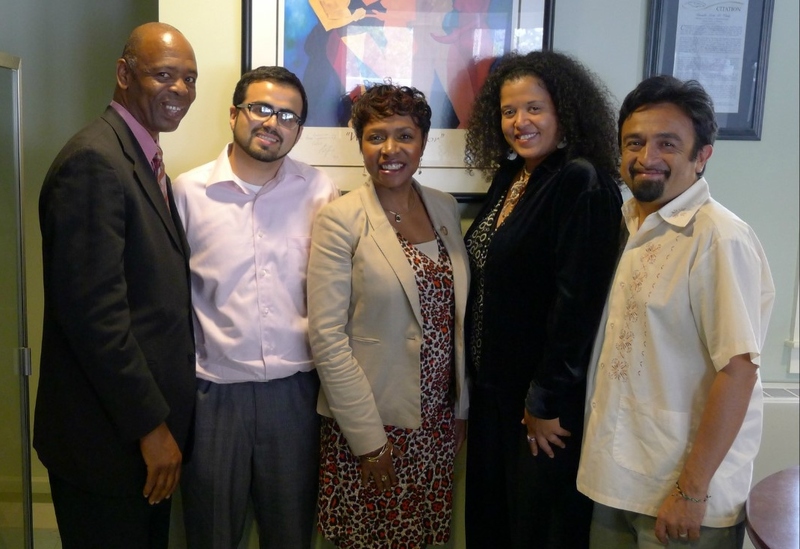 A delegation of organizations from the New York area met with Rep. Yvette Clarke (Brooklyn) to discuss the high cost of receiving a phone call from a prison, jail or detention center. On August 21st a delegation of organizations from the New York area met with Representative Yvette Clarke (Brooklyn) to discuss the high cost of receiving a phone call from a prison, jail or detention center. The visit was held as part of a larger effort called the Campaign for Prison Phone Justice, a national campaign seeking to lower the cost of prison phone calls. Member organizations included: Center for Media Justice, Peoples Production House, Families Rally for Emancipation and Empowerment (FREE) and Pastor Will Seaton. The delegation petitioned Representative Clarke to send a letter to FCC Chairman Julius Genachowski in support of the Wright Petition (docket no. 96-128), a measure that would make the cost of long distance phone calls from prisons more affordable. Kym Clarke of FREE shared her story of organizing a successful campaign in New York that made the cost of local calls more affordable for prisoner’s families. New York is currently one of eight states that has passed regulation at the state level to make these phone calls more affordable, but it doesn’t apply to long distance phone calls. Pastor Will Seaton shared his experience doing ministry at juvenile detention facilities in Essex County, NJ. He’s witnessed firsthand how youth are further isolated from their families and community by the prohibitive cost of the phone calls.